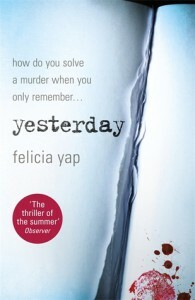 „Yesterday“ is one of the most unique books I read so far. It is set in an alternate reality where people can remember only for a short time. In this alternate world a murder takes place. There are two different kinds of people: Monos, who could retain just the day before and Duos who have memory of the last two days. Duos think they are superior to Monos. They think they are cleverer and there are jobs which are only given to Duos, although most of the people are Monos. Children and teenager can remember everything, but at a certain age things change and they become Monos or Duos. They start to write diaries. They write down what they think is important to remember and the next day they learn these things. So it gets into their long-term-memory and they remember it. This situation is not really explained in the book. It is just treated as a fact. Reality is like this in this book. It is not a Dystopia; it is just a book which takes place in a different reality. At first I found that very confusing. I was not sure if this could work and how it all worked. I was checking all the time if everything that happened was according to this memory situation. But while I kept reading and the more things developed and got explained I got used to this setting. I am not going to tell too much about the story itself. I was fascinated by this memory thing. Being a Duo or a Mono divides the society into two classes. There is a lot of discrimination going on. The story about the murder is very complex and told from different POVs. There are many twists and unreliable characters. Writing a diary is a very delicate thing. The characters write to remember their own past. But they choose what they think is necessary to remember. That can also mean that they choose to leave something out so they will forget it. The story is very unique and is told with great earnest. The author adds more and more details. It is a really unusual story with an unusual setting. The thing about the murder could have been a little bit more gripping. The main thing here are the characters and their problems. With their life without remembering important things and without the learning effect they bring. I was not absolutely gripped by the book but it was interesting and I enjoyed reading it.